There are plenty of ways to be creepy and awkward at the gym, in the office, and in life in general. The public drinking fountain is certainly one potential scenario that can make for awkward situations, guaranteed to leave everyone involved cringing. 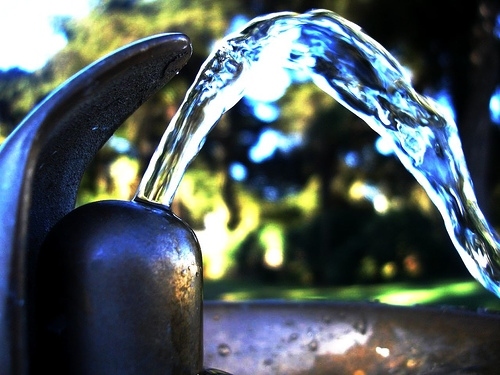 While many have made the move towards bottled water, we believe there’s a great value in making use of the drinking fountains afforded to us… Or at least, the rising mass of non-biodegradable plastic waste certainly signifies so. With that said, and with the intention of inspiring some form of decent etiquette when it comes to drinking from a water fountain in public, we’ve compiled a list of do’s and don’ts that will help you to look less like one of our waggy-tailed four-legged friends and more like the educated and capable, albeit thirsty, individual that you are. While waiting in line, DON’T crowd the person in front of you. It’s awkward enough to be the one bending down slightly to get the water into your mouth, without the beady eyes of an observer looming above. It’s just creepy. We know that it’s almost impossible to drink water from a drinking fountain without that horrible slurping sound, but we ask that you DO try to keep this slurping to a minimum. If you’re filling up your water bottle, but the person behind you is only after a minimally-slurpy sip or two, DO the courteous thing and allow them to go first. Don’t ever make lip contact with the nozzle. Ever. We hardly need to mention germs to explain the logic behind this one, but please, don’t be that guy. One word: gargle. Don’t. Do that at home. Don’t spit in the drinking fountain bowl. Spitting in public is not okay in the first place, and doing it in a drinking fountain is just gross. Don’t use the drinking fountain as a place to wash your hands. There’s another invention for that – it’s called a “sink”. Use it. While we can’t stop you from falling down the stairs or spilling your freshly made cup of coffee down your shirt, we like to think that in some way we’ve contributed to your existence as a well-rounded individual. We encourage you to go forth and make use of drinking fountains near and far; so long as you DO what we’ve told you. Drink up!